I’m looking out the window of my home, watching light flurries of snow fall from the sky. This is the gentlest winter has looked since I landed back in Toronto after enjoying a slice of paradise in Montego Bay. I can’t remember the last time we’ve had a true Canadian winter with its biting winds and piled snow banks. As much as I’ve missed it (yes, I’m a proud Canadian and lover of all seasons), I was excited for a week escape to stock up on some much-needed vitamin D that would carry me through the worst of it. And so far it has. I’ve been to Jamaica once before — Ocho Rios, to be specific. I fell instantly in love with the beaches, food, culture and people. I knew I’d be back, which is saying a lot because I’m the type of traveller who likes to experience something new with every trip. 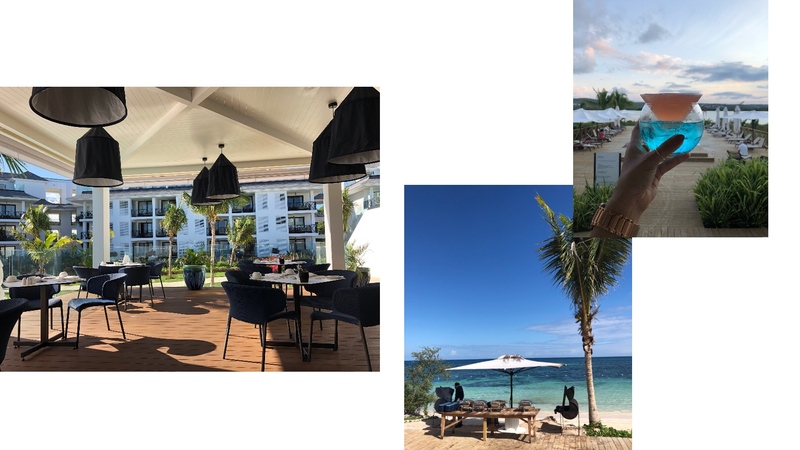 When Air Transat reached out to me about its luxury collection of resorts in Montego Bay, it took very little convincing to hop on the Club Class flight heading in that balmy direction. The four hour flight was as breezy as I imagined the Caribbean air would be as soon as we landed. There’s no other way to travel than Club Class, although I’ve also had pleasant experiences in economy with Air Transat in the past. From the spacious seating and complimentary comfort kit — that, by the way, was so unexpectedly well-designed we stuffed our bags with it afterwards to use back at home — to an incredible meal prepared by Quebec chef Daniel Vézina, we might has well have been travelling on cloud nine. Although I’m a light packer by nature, I appreciated the extra luggage perks my friends took good advantage of and I especially loved the priority services. 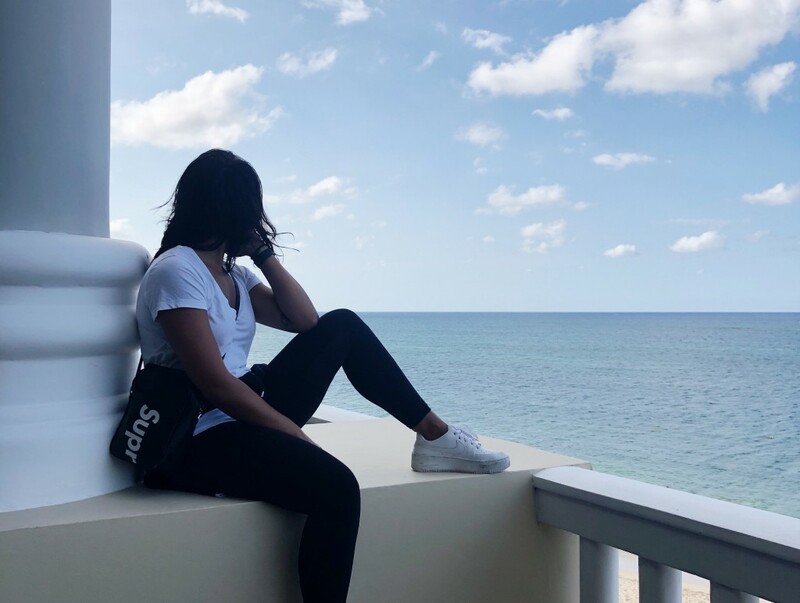 From beginning to end, going from snowy Toronto to sandy Montego Bay was so effortless I had actually begun the vacation well before I’d even changed into a tank and shorts. That didn’t stop me from immediately switching my outfit as soon as we checked into our first resort. I felt the only way to truly admire how beautiful Excellence Oyster Bay was to be either in a swimsuit or a flowing dress. I went with the latter since we arrived just in time for dinner. How beautiful was Excellence? 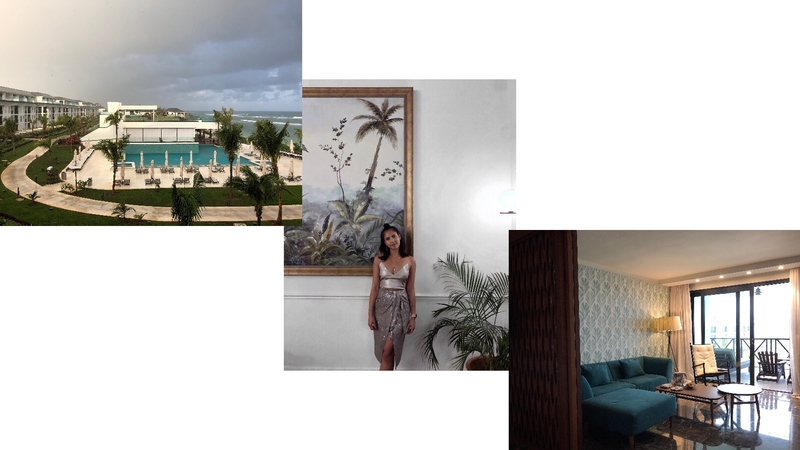 Imagine marble floors, sweeping white walls and arched doorways decorated with a mixture of clean modern objects, rattan furniture and giant paintings worthy of an art gallery. For lack of a better analogy, it was heaven on earth. 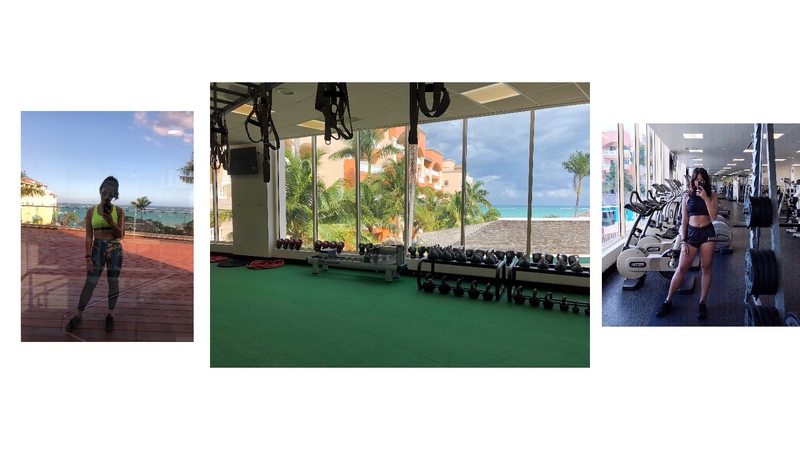 As much as I loved the architecture and decor, which was on high display at the spa, my favourite thing to do each morning was to take an easy jog along the beach before heading up to the gate to clock in the kilometres. I only learned that tip later from the personal trainer at the gym — a service that is free on certain days! I loved this routine because it really showed me how singular the resort is, especially the cove it carved away for itself. This still-expanding area offers picturesque spots that reveal different personalities, which can only be experienced if you take a calming stroll or invigorating jog along its length. Of course, after all that activity, I ate all of the food. Indulging in some beach-side jerk chicken was one of my favourite mid-afternoon rituals. But it was hard not to be impressed by each of the restaurants on site. Again, Excellence Oyster Bay tried to rival the dishes with its decor. Yet the best experience I had was unequivocally the spa. I’ve enjoyed hydrotherapy before, but never on this scale. I don’t want to ruin the experience with too much detail, but I would almost — almost! 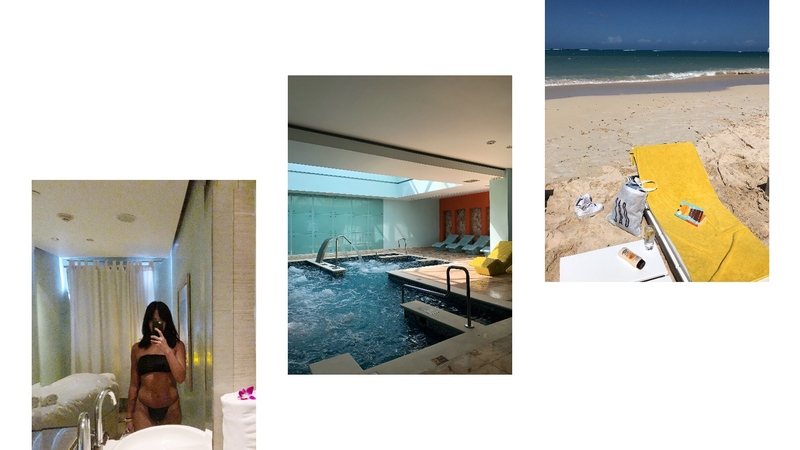 — encourage guests, if they had to choose, to indulge in the water therapy over a more traditional massage. It was a relaxing rollercoaster, an oxymoron I stand behind, that remains a highlight of my trip all together. Although we only stayed for a day, it was easy to see how Melia Braco Village would charm just about anyone. 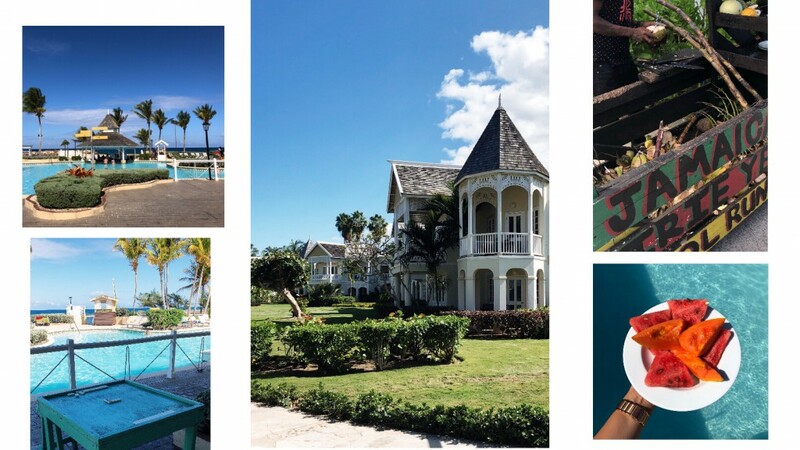 Whether playing dominos by the pool, drinking out of a fresh coconut or listening to steel drums, we really felt like we were in Jamaica…with all the added benefits that come with staying at a luxury resort. At the end of our fourth night at Excellence Oyster Bay, it was time to pack up to visit our final resort. Iberostar Grand Hotel Rose Hall is exactly as its name suggests — grand. 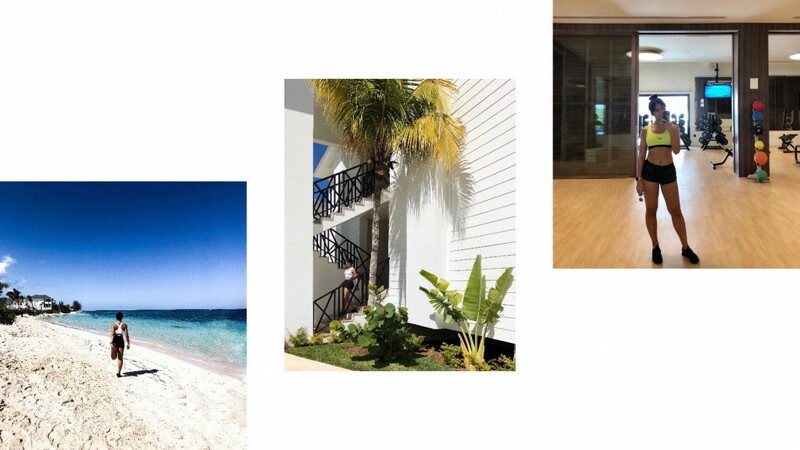 From its grand ceilings to its grand staircase and sprawling grounds, this resort is basically a three-in-one when you count its two sisters just adjacent, connected both by the beach outside and convenient corridors inside. As luxury guests, we were able to access all the facilities. 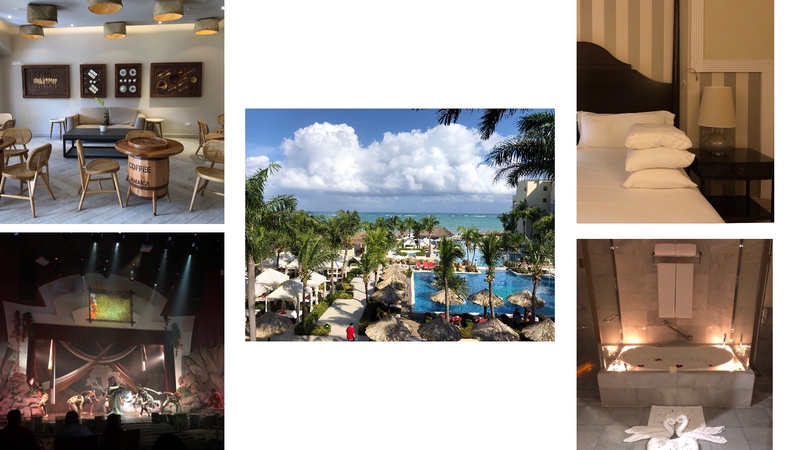 Now, this might sound like I picked a favourite, but what I quickly realized after our initial introduction to Iberostar was that each resort we visited were so different from each other, I could see wanting to stay in one for one reason and another for another. During this particular season of my life, with all of my new year resolutions rumbling in my mind, Iberostar was the resort for me. 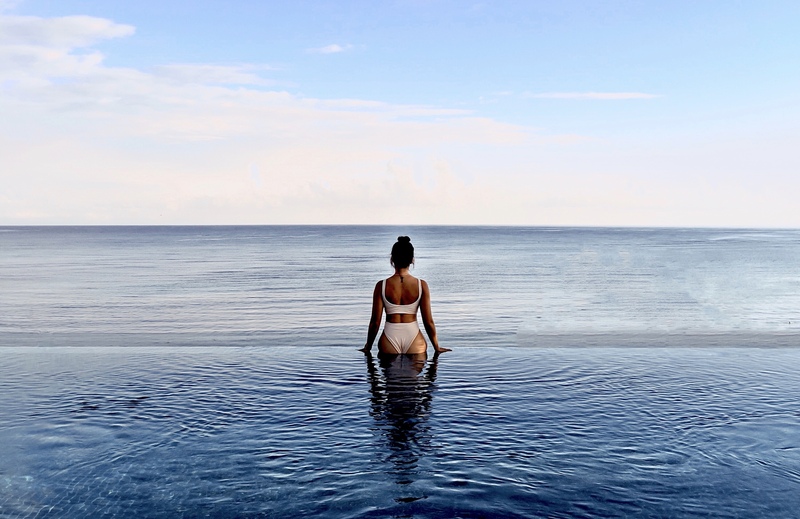 Although not as shiny and new as the seven month old Excellence or as quaint as Melia, I fell for its beach and unobstructed waters as well as the updated fitness amenities and schedule. Beyond that, I couldn’t resist all the attention to detail. With wellness top of mind, I took advantage of the ensuite pillow menu (I’m forever nursing sore necks from too soft pillows — but not this time!) and a romantic bath drawn by our floor’s personal butler. I was also absolutely blown away by the entertainment provided. Changing the theatre set every night, we treated ourselves to one show centred around the history of Jamaica and it was as though Cirque du Soleil had taken over. The performance was outstanding. 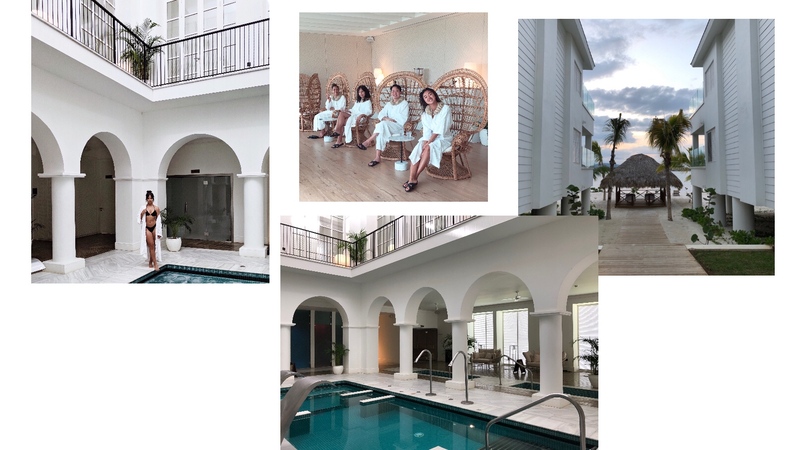 We ended our stay with a special spa appointment centred around a coffee scrub and massage ritual. Considering how well Jamaica is known for its blue mountain coffee, I was excited to walk away with such a unique treatment. After hours tanning under the hot Caribbean sun over the last seven days, my skin needed a good buff. Two weeks later and it’s still glowing. If you followed along while I was away, you’re probably scratching your head wondering why I haven’t touched on all the fun adventures we all went on while in Jamaica. Well, I will. Just not here. We ended up doing so much — which I still can’t get over because I came home more relaxed than ever — that I would do this whole trip injustice if I tried to cram it all in one article. So stay tuned for its sequel!